Don’t let the basic pipe and drape from the contractor get you down. An in-line booth does not have to be cookie-cutter and detract from creating a great booth space that is engaging and draws in traffic just because you have neighbors. We have several ways to make the most of your in-line booth and can help you stand out! Designed for standard inline exhibit requirements with 8 ft height. The same property components can be used to create multiple different layout options to give you versatility. The backwall area can be utilized for a casual meeting space, or it could be set up for a double-sided demo kiosk. For a seamless look, the display uses SEG push to fit silicon edge fabric graphics or plain white and printed PVC Sintra graphic panels. All graphics can easily be updated. You can add counters, demo stations and new graphics to change your look over time. 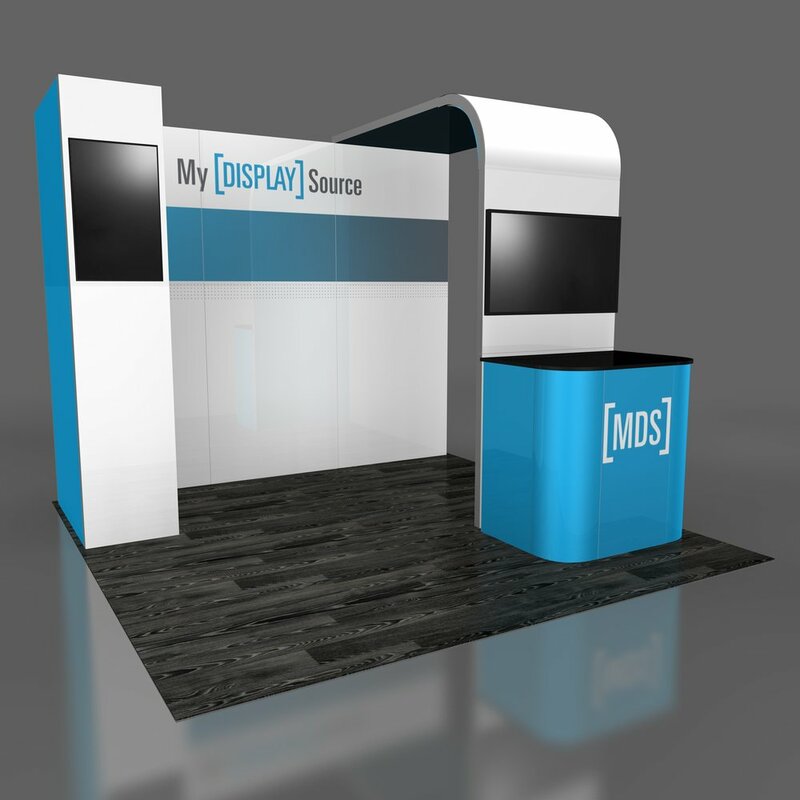 This booth is designed for inline 10’x20’ exhibits using a standard 8 ft (2.4 meters) high backwall and meets the setup requirements for most US based events. This versatile package is modular and has the same property components that can be used to create multiple layout options including 8’x10’ and 10’x10’ space setups. You can add counters, demo stations and new graphics to change your look over time. This custom 10’x20’ modular setup was designed with functionality in mind. Its versatility allows many different inline setups and works as a larger peninsula island. The 12ft tall backwall can also reconfigure for a standard 8ft height if needed. The modular structure of this property with its components can create many different layout options for multiple exhibits including 8x10’ and 10x10’ space set-ups. You can add storage room access, counters, demo stations, overhead lighting and new graphics to change your look over time. Interested in other ways to beef up your inline display? Check out our display packages or reach out, and we can find the best solution to fit your needs and budget! Older PostShowing at Sands? We've Got You Covered!